It was not until the early 1900s that humans first set foot onto the continent of Antarctica. Today it is still considered “the final frontier” for exploration on Earth, because of its remote location and harsh conditions. This month, two expeditions to Antarctica will carry the WINGS WorldQuest flag. Homeward Bound is an initiative that aims to elevate the voices of women in science in the hopes that they will play a large role in influencing scientific policy in the years to come. The organizers envision a 10-year initiative, through which they hope to reach 1,000 women in science. The Homeward Bound team with the WINGS WorldQuest Flag. Photo courtesy of Homeward Bound. These women, all with critical science backgrounds, are involved in a year-long state-of-the-art program to develop their leadership skills. The inaugural Homeward Bound expedition, featuring 76 participants, launched earlier this year and is culminating in a 21-day voyage to Antarctica that set sail from Ushuaia, Argentina on December 2. Joanna Young, a PhD candidate studying glaciers at the University of Alaska Fairbanks, is on Homeward Bound’s maiden voyage. Young said having the expedition comprised of only women helps create a collaborative, unified network of women who can support and bolster one another. Many of the women work in academic disciplines that are competitive, but the expedition offers an alternative. “It’s a non-competitive environment – we’re all collaborating and learning together and brainstorming ideas that will benefit the planet and people as a whole,” Young said. Young told WINGS that one of Homeward Bound’s missions is to talk about sustainability and global change related to climate change. Antarctica serves as a motivating backdrop of a rapidly-changing environment for the voyage, as well as a sort-of “canary in the coal mine” for larger environmental issues. Antarctica can even help scientists understand worlds that exist beyond the Earth. 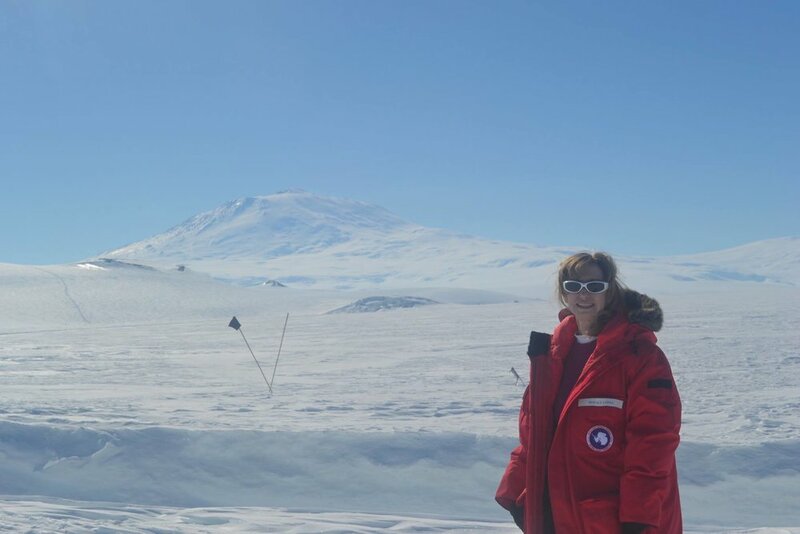 Volcanologist and WINGS Fellow Rosaly Lopes is in Antarctica on a month-long expedition to Mount Erebus, the southernmost active volcano on Earth. Lopes is completing a book project with astronomical artist and science writer Michael W. Carroll, focused on using landscapes in Antarctica to help readers envision what other worlds look like. Mount Erebus features one of the only lava lakes on Earth. Lava lakes are quite common on Jupiter’s moon Io, which Lopes has studied extensively with her work at NASA’s Jet Propulsion Laboratory. The book will also feature accounts from Lopes and Carroll about what it was like to live and work on Antarctica. The project highlights the need to continue to protect Antarctica in the name of science – so far, strong environmental restrictions have prevented humans from contaminating the continent. “It’s a good example for exploration, and maybe we should follow that on many other places on Earth,” Lopes said.